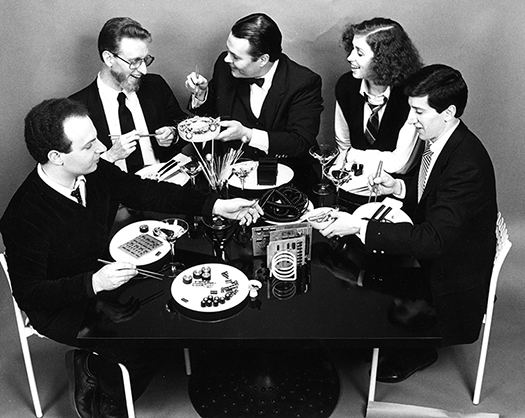 At the end of the 1981 performing series, the core members of Other Music decided to bring the large ensemble to an end and return to being a small ensemble. Among the reasons for this decision were fatigue from maintaining discipline in a group of a dozen unpaid volunteers and mediating the personality conflicts that inevitably occur in such a group, and musical interests that required resources beyond the gamelan. At some point around this time, Dale had acquired a Hohner Clavinet (a retunable electroacoustic keyboard instrument, popular with rock bands at the time) and somewhat later, a Sequential Prophet V synthesizer, one of the first programmable hybrid synthesizers, and the first to feature user programmable tunings. The added resources provided by these instruments, especially the Prophet, which could change tunings at the push of a button, suggested new timbral and intonational possibilities. (Building a gamelan is a great way to achieve stable Just Intonation with a fixed set of pitches, but it doesn’t offer much flexibility, if any. Once you’ve chosen the tuning and built and tuned the instruments, you’re pretty much stuck with the results of your choices.) The remaining members of Other Music—Henry, Carola, Dale, Andy Fischer, and I—decided to compose and record an album of material that combined instruments from the gamelan, the Prophet, and other electroacoustic and acoustic instruments. The result was the LP Incidents Out of Context, on the Flying Fish label, released in 1983. In addition to gamelan instruments and synthesizer, Incidents featured Henry’s refretted electric guitar, Carola’s tenor sax, and Andy’s hammered dulcimer and dumbec. Incidents was the last major project from Other Music to see the light of day. After the release of Incidents, we put a lot of energy into building an eight-track recording studio, to save the expense of purchasing studio time for our “next album” (which never materialized). There was also a program of building sound processing modules—driven largely by my desires and interests—that consumed a lot of time, energy, and money, but produced little in the way of useful results. In late 1984, Henry, Carola, and I founded The Just Intonation Network, under the auspices of Other Music, Inc., the nonprofit that we created to support Other Music’s activities, but that is another story. I continued to compose in Other Music’s eight-track studio, which I gradually transformed into a MIDI studio as the technology evolved. Carola also worked in the studio periodically. Henry’s focus shifted to film production and he and Carola became involved in the acquisition and rehabilitation of residential properties in San Francisco’s South-of-Market neighborhood. Andy went to work in the computer industry, where I shortly followed. Dale had not submitted a composition for Incidents and ceased to be involved in the group shortly after the completion of that recording. The last recordings to carry the Other Music name and feature members of the group performing together were two selections on the cassette compilation Tellus #14: Just Intonation, curated by the Just Intonation Network and released in 1986: Carola Anderson’s “Shibboleth” and my “Fake Greek Music.” Other Music succumbed to the members’ diverging interests, musical and otherwise, changes in technology, and the pressures of adult life—jobs, families, and the like. An attempt to revive Other Music as part of the Just Intonation Network’s twentieth anniversary concert series in 2005 was unsuccessful.